"I love when non-fiction filmmakers stretch the form and attempt, with as much honesty as they can muster, to put us in the middle of the events they describe. 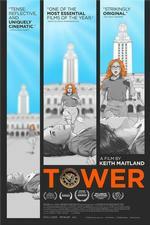 They give us stunning hybrids like "Waltz With Bashir," "Persepolis," and, now, TOWER." "Through the recollections of witnesses and victims, the film simultaneously builds a present-tense narrative while portraying the terrifying resilience of memory and trauma." "Using a limited frame, Mr. Maitland does his own commemorating, inherently raising questions about terror, the nature of heroism and what it means to really survive. He also does something even more necessary: He turns names on a plaque into people."